Luigi has just won a mansion in a contest. His excitement is surpassed by his confusion, as he did not actually enter a contest. Nonetheless, he tells Mario about the mansion and the two agree to meet up outside of it that evening. With a flashlight in tow, he follows the map to the mansion. It is noticeably much more sinister looking than it is in the supplied photograph. To make matters worse, Mario is nowhere to be found. With a strong sense of dread, Luigi enters the mansion. As was the case with any preceding Mario launch title, players first found themselves having to adjust to the new controller. The Nintendo Entertainment System’s (NES’s) controller established a firm standard for the medium; it had a directional pad, two action buttons, and two buttons intended to navigate menus. The controller for the Super Nintendo Entertainment System (Super NES) was an upgrade from that of its direct predecessor, featuring more buttons for players to use. Finally, the Nintendo 64 controller ended up being Nintendo’s most experimental apparatus, featuring three grips for two distinct styles of gameplay. Despite their differing shapes, all of these controllers had one commonality: they were attempts on Nintendo’s part to lead the pack. For the most part, they were successful. The NES controller eschewed the arcade-style joystick famously codified by the Atari 2600, Intellivision, and ColecoVision in favor of the flat directional pad. This afforded players a greater degree of control when navigating their characters in 2D platformers. Meanwhile, the SNES controller’s most significant contribution to the medium was the inclusion of two shoulder buttons, which allowed players to use their index fingers to input commands in addition to their thumbs. The Nintendo 64 controller, on the other hand, marked the first instance in which Nintendo’s innovations failed to catch on. Although having players grasp the center or left grip depending on the style of gameplay was an interesting idea, it rendered a button inaccessible at any given time. Meanwhile, Sony managed to blaze the trail Nintendo couldn’t when they introduced their first Dual Analog Controllers – succeeded a year later by their trademark DualShock line. This device allowed each hand access to a different analog stick – the left controlled the character while the other performed a secondary function such as adjusting the camera. Coupled with the comfortable grip that naturally fit one’s hands, Sony’s was clearly the example to follow. It is fitting then that, knowing a winner when they saw it, Nintendo decided to take cues from their competition by designing a similar controller. The GameCube’s controller features buttons labelled “A”, “B”, “X”, and “Y” on its face. There are three shoulder buttons – in addition to the familiar “L” and “R” buttons, there’s a third “Z” button situated next to the latter. It’s a curious choice given that there is no corresponding button on the opposite side of the controller. Within easy reach of the left hand’s thumb is a control stick and directional pad, which are used to move the character. The most notable addition the GameCube controller has to offer is the yellow stick on the side opposite the directional pad. Because the “C” buttons usually controlled the camera, they have been repurposed into a “C” stick instead. However, like the “C” buttons that preceded it, the “C” stick can be used for other purposes as well. When you are given control of Luigi for the first time, it is immediately obvious that Luigi’s Mansion isn’t going to be like any of its predecessors. Though ghost houses featured in previous Mario installments, the titular mansion of this game is quite a bit more oppressive. Reaching the end of the game isn’t a matter of making precarious jumps across moving platforms. In fact, there is neither a run button nor a jump button, which seems downright heretical for a Mario game. Even Super Mario RPG stood out from contemporaries by featuring platforming elements. On top of that, the game relies on fixed camera angles, which seem to actively rebel against the sensibilities players developed playing Super Mario 64. 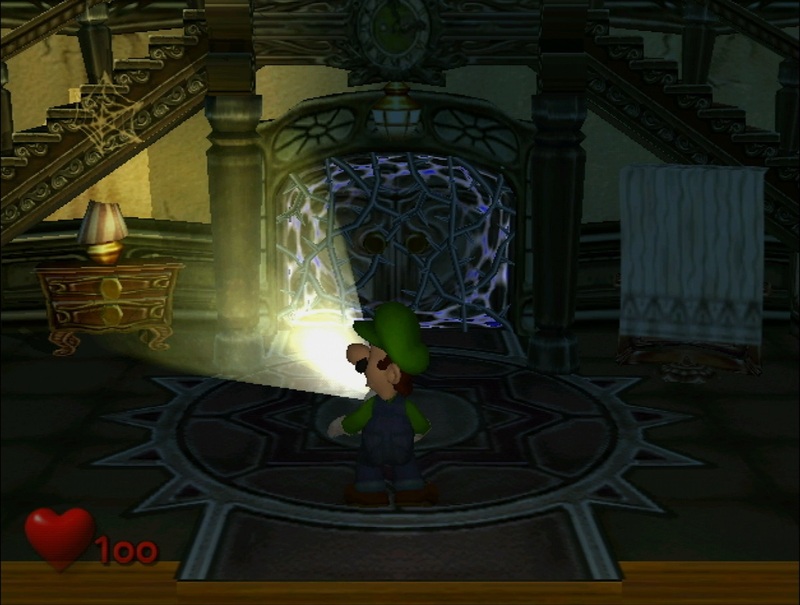 Further distancing itself from its platformer predecessors, Luigi’s Mansion features a health meter in the form of a heart displayed on the bottom-left corner of the screen. It functions straightforwardly enough; Luigi has 100 units of health. If it is completely depleted, the game is over. There are no extra lives to be found, so every defeat is permanent. The mansion is utterly devoid of means by which Luigi can increase his maximum health. He also does not have any means of reducing the damage he takes, so you would do well to adjust to the controls as soon as possible. Without the ability to run or jump, Luigi is quite limited in what he can do. From the onset, he is armed with only a flashlight, which can be toggled on and off by pressing the “B” button. The control stick is used to move Luigi while the “C” stick changes the direction he faces. If you wish to examine something in the room such as a piece of furniture or drawers in a cabinet, you must tilt the control stick in the direction of the object. When Luigi is pressed up against it, you can press the “A” button to have him examine it. If it contains anything important, its contents will spill out onto the floor. 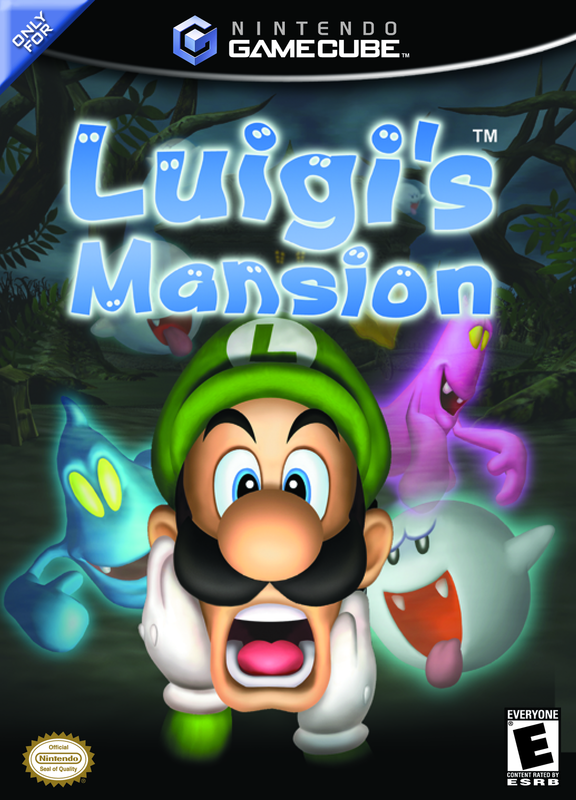 Though the title of the game along with its cover art should have cued players into what kind of experience Luigi’s Mansion is to provide, the opening sequences proceed to remove any lingering doubts. With a large growth of thorns denying Luigi access to the first floor hallway, he tries opening one on the second floor. To his frustration, it too is locked. As if on cue, an orange, intangible manifestation appears, dropping a key for Luigi. A nervous Luigi takes this key and unlocks the door. To his shock, he soon finds himself accosted by a ghost. Just when all hope seems lost, he is saved by an older man wielding what appears to be a vacuum cleaner. Despite the old man’s best efforts, the ghost overpowers him and flees. Introducing himself as Professor Elvin Gadd, the man escorts Luigi to his laboratory near the mansion. The professor explains to Luigi that the house doesn’t really exist; it’s an illusion conjured by the ghosts who dwell within it. As they have likely captured Mario, it’s up to Luigi to save him. Though Mario and Luigi have historically been able to fight ghosts in the past, the ones haunting this mansion play a completely different game. As such, attempting to punch or kick a ghost would only result in the attack harmlessly phasing through their bodies. To make matters worse, the mansion is utterly devoid of Koopa shells, Super Stars, or Cape Feathers, so the most obvious means by which Luigi was historically able to bust ghosts are unavailable to him. Luckily for Luigi, E. Gadd gives him exactly what he needs to fight back against these foes. The vacuum cleaner he donned was, in reality, the Poltergust 3000 – a device of E. Gadd’s own invention. 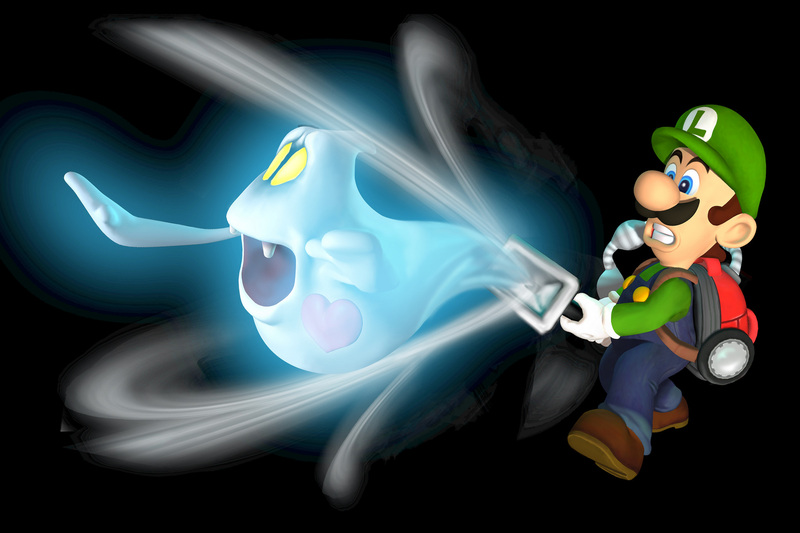 With it, Luigi can trap ghosts in the vacuum’s bag – a prison from which they cannot escape. However, successfully using the Poltergust 3000 requires players to be a little more tactful than simply walking up to a ghost activating the vacuum. To trap a ghost, you must first expose its heart. To do this, Luigi must point his flashlight at the ghost. Once its heart is visible, only then by pressing the “R” button can he make an attempt to trap it. Ghosts have a health meter of sorts that appear as a number when attempting to trap them. When the number is reduced to zero, the ghost is done for. The meter drains at a standard rate, but holding the control stick in the direction opposite the ghost is relative to Luigi’s position causes the number to drop much faster. It’s important to note that, because the Poltergust 3000 is a vacuum, Luigi can utilize it in more mundane fashions. If there is a pile of dust blocking your way or a sheet covering a piece of furniture, there’s little stopping you from using the vacuum to get rid of the problem. This doesn’t work on every object that can be sucked up by the vacuum. In fact, it’s important to recognize when this tactic is proving ineffective. If you try to use the Poltergust to get rid of a sheet or object affixed to its set piece, Luigi will eventually take damage from the attempt. Depending on the circumstances, you can even use the vacuum to take hold of a larger object such as a ball and launch it at certain enemies. Over the course of his adventures, E. Gadd had trapped certain ghosts into paintings to display in his personal gallery. 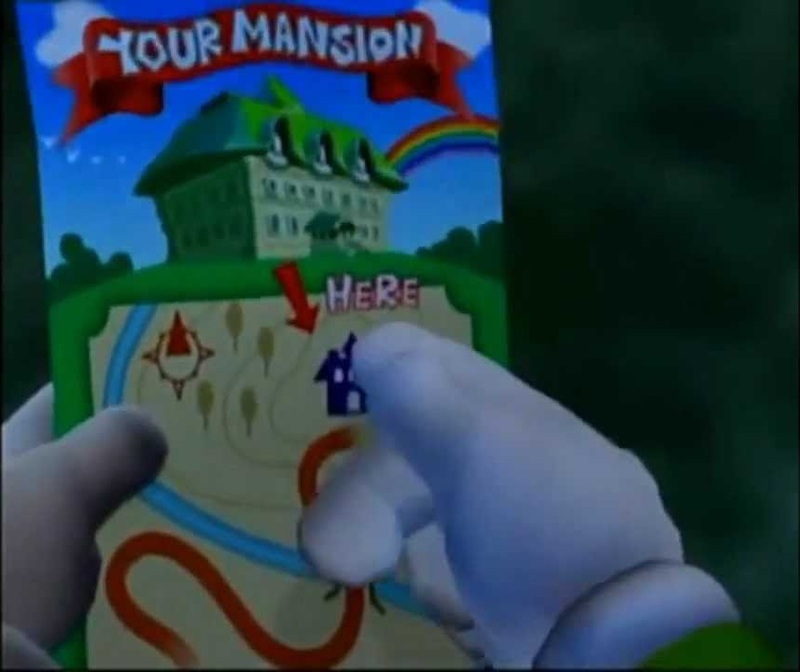 To his immense frustration, King Boo released all of them, resulting in the mansion’s manifestation. These Portrait Ghosts can be found all throughout the manor, and are markedly more difficult to defeat than the standard ones. For a majority of them, you need to observe their behavior carefully in order to even expose their hearts. To wit, the first Portrait Ghost is Neville, the Bookish Father. True to his descriptor, he spends his days reading the books lining the shelves of his study. He occasionally yawns and stretches. When he does, he becomes vulnerable to light, which allows Luigi to expose his heart in an attempt to capture him. Though your tactics for capturing a Portrait Ghost are largely unchanged, there are a few extra factors to consider. To begin with, your attempts to capture a Portrait Ghost cause pearls to appear. Larger pearls appear the more health Luigi drains from a Portrait Ghost in a single attempt. For every ten units of health drained, a small pearl appears. If Luigi is able to drain at least 50 units of health at once, a medium pearl appears with another one being rewarded for every subsequent 10. Finally, if Luigi is able to drain 90 units at once, he will be rewarded with a large pearl. 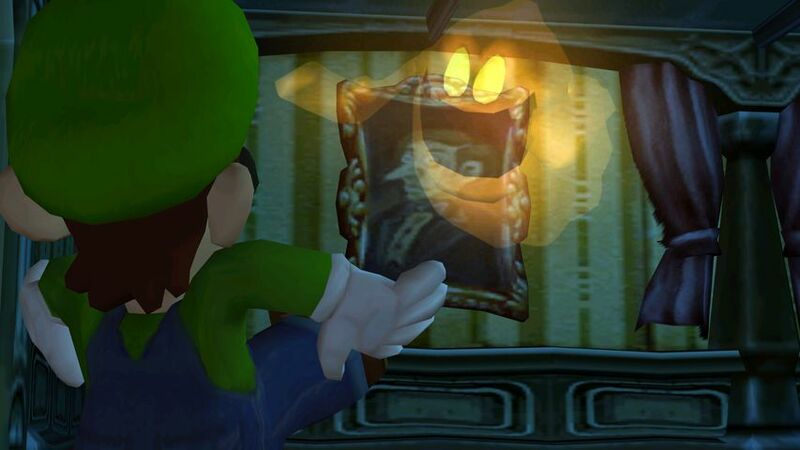 The size of the pearls Luigi receives will affect the color of the Portrait Ghosts’ frame in E. Gadd’s gallery. If he only receives small pearls, the frame will be bronze. Meanwhile, collecting one medium pearl will turn it silver and obtaining a large pearl renders it gold. Attempting to capture a Portrait Ghost is often easier said than done. As they struggle, they have a habit of dropping Poison Mushrooms. In addition to damaging Luigi, they shrink him in size and forbid from using the Poltergust, thereby breaking his lock on the ghost. 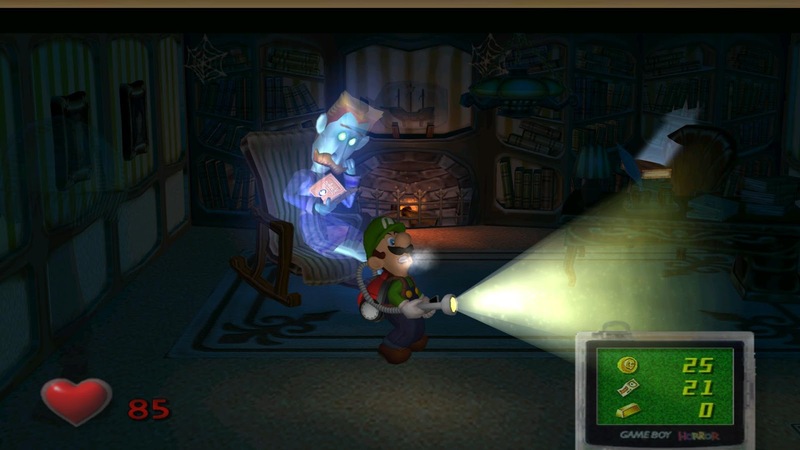 Many of the Portrait Ghosts also possess unique attacks, which must be avoided while simultaneously retaining Luigi’s lock on them. The purpose of the pearls they drop is a little unclear at first, for Luigi’s Mansion doesn’t feature a bartering system of any kind. Instead, in a manner similar to Wario Land: Super Mario Land 3, they factor into what ending the player receives. 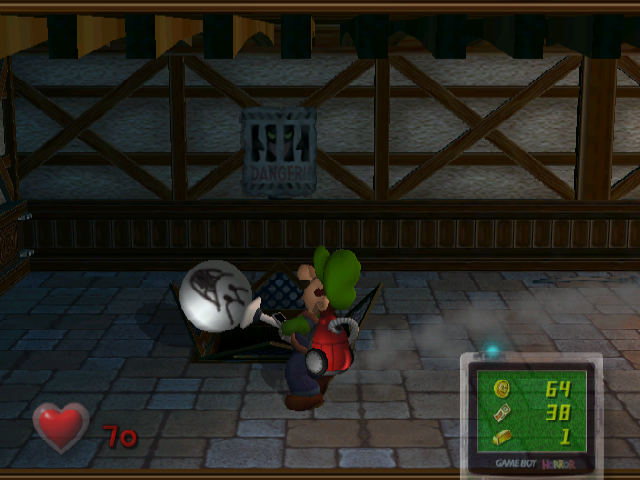 After ridding the world of the haunted mansion, Luigi can give the money he finds to E. Gadd. In return for his services, the professor will build Luigi a real house. As one would expect, a greater amount of money will result in a better domicile. In addition to pearls, the mansion is littered with coins, bills, and gemstones, so a player would do well to scour the mansion extensively. 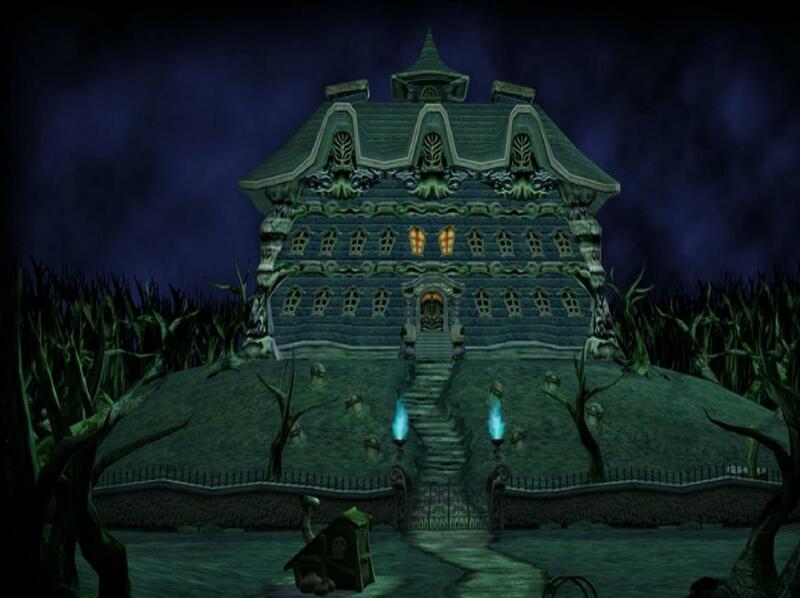 Luigi’s Mansion was probably the single best project Nintendo could have used to showcase the GameCube’s graphical capabilities. The simple act of using the flashlight reveals that it illuminates the room fairly realistically. The beam is highly concentrated near the source before spreading out. This development has a fairly interesting story behind it. From the beginning, director Hideki Konno and his team wanted the entire game to take place in a gigantic house, though Mario was intended to be the protagonist. The building in question was originally intended to be a “Japanese-style Ninja house”. After various playtesting sessions, it was redesigned to resemble a dollhouse. This was justified by the player always looking through a wall to view the rest of the room. Finally, when the team began incorporating darkness and shadows into their design, they turned the dollhouse into an “American-style haunted mansion”. Because of the drastic setting change, the team decided to cast Luigi in the lead role, for they wanted a cowardly character to face the horrors of this mansion as opposed to the brave Mario. It is when you’re outlined exactly what the game entails that its true nature reveals itself. Luigi’s Mansion is what you would get if you set a survival horror game in the Mario universe. This would make it a timely game, as it doubtlessly spawned from the horror boom following the overwhelming success of Capcom’s Resident Evil. With the manor itself coming across less as an actual location and more of a malevolent being from another dimension, Luigi’s Mansion is quite a bit darker than a standard Mario game. Despite obviously not being as grotesque as an M-rated survival horror title, the game doesn’t pull any punches when it comes to making the player feel paranoid. Ghosts can easily jump out at Luigi when he examines the furniture. Not only that, but fake doors litter the mansion, slamming Luigi into a wall if he attempts to open them. This is practically guaranteed to catch the player off guard the first time around. Though this sounds like a cheap design choice, it’s actually a clever way to make the player feel paranoid. This, in turn, might spur them into noticing subtle details they would overlook otherwise. For example, the false doors don’t shake if you vacuum them, nor do they appear on the map. Despite these innovative ideas, I ultimately feel the Portrait Ghosts are where this game shines the most. With only a few lines apiece, these ghosts have much more personality to them than your standard video game monster. They all have creative, eye-catching designs to them, and I particularly enjoy how they form an extended family. The first ghosts Luigi must deal with are a father, a mother, and their baby. Contrary to what one would expect, the baby is the first boss of the game while his parents are minibosses. As you progress through the game, you can amass a database of these ghosts, which detail their backstories. They range anywhere from horrifying to surprisingly saddening. Mr. Luggs is a morbidly obese ghost with a monstrous appetite, and the database outright states that he ate himself to death. Meanwhile, another ghost pines for the affection of another and his feelings remain unrequited. It doesn’t even shy away from the idea of children dying. The aforementioned baby is said to have been born a ghost, and there is a girl who died in her sleep at age six from what was supposed to be a quick nap. The boss of the second area, Bogmire, is even revealed to be the product of the mansion’s fear and despair. What I like about these developments is how they seem to add a degree of ambiguity to the proceedings. Although some Portrait Ghosts attack Luigi with little provocation, many of them are minding their own business and want to be left alone. Then again, because a majority of them are only ever seen doing their one favorite activity, the argument could be made that theirs is a cursed existence. They’re doomed to repeat their actions in life for all of eternity, being unable to move on to the afterlife. If nothing else, they’re actively prohibiting Luigi from rescuing Mario – if not by attacking him, then by holding the key he needs to advance and refusing to hand it over to him. It’s also worth mentioning that despite its slower gameplay and claustrophobic design, Luigi’s Mansion still has plenty of creative boss fights. Though you do not need to capture all of the Portrait Ghosts in order to complete the game, exposing their hearts and subsequently vacuuming them does typically require you to examine the environments closely. Because the gluttonous Mr. Luggs throws a tantrum whenever he isn’t eating, your first order of business is to remove the servants providing his food. Perhaps the greatest contribution Luigi’s Mansion brings to the Mario franchise is that by casting Luigi in the lead role, his characterization is fully realized. In his introductory game, Mario Bros., he was effectively a clone of his brother Mario. To enforce this, his name as it’s rendered in Japanese sounds exactly like “ruiji”, which means “similar”. That there happened to be a similar-sounding Italian name capable of thematically complementing Mario’s in the Western world was highly serendipitous. Super Mario Bros.: The Lost Levels would be the first game in which he was substantially differentiated from his brother. Specifically, he could jump higher than Mario at the cost of being a little more difficult to control. This characteristic would stick with him throughout the series. While Luigi had been distinguished from Mario shortly after his introduction, he was still effectively the same exact character. Supplementary materials such as comic books and television shows attempted to flesh out his character more. Many of them established him as more of a reluctant hero compared to Mario, but only the most devoted fans would have sought these works out. What Luigi’s Mansion does is capture the title character’s defining traits in video game form. This isn’t something older games had attempted – or at least not to the degree shown in Luigi’s Mansion. A majority of the games in which he starred were decidedly terse when it came to dialogue – assuming it existed at all. His most extensive speaking role was in Paper Mario, the spiritual successor to the Square-developed Super Mario RPG. While it did lend a degree of insight to his character, he was still ultimately delegated to the background. As if to reflect this, a significant chunk of his dialogue consisted of him being jealous of Mario’s adventure. Luigi’s Mansion, on the other hand, set the record straight and gave Luigi his definitive characterization. He is cowardly, yet prone to acts of bravery when push comes to shove. In fact, it is through the act of putting this characterization in a video game that it well and truly stuck. This is because his body language changes drastically to match his situation. You can sense his trepidation as he navigates the dark rooms. In these situations, he grits his teeth, his breath turns to mist, and he can be heard nervously humming the game’s theme. Clearing a room of ghosts causes the lights to turn on automatically. In these well-lit rooms, he is markedly calmer, which is punctuated by him confidently whistling the game’s theme. There’s even a button that causes Luigi to call out to Mario. Depending the state of the room and the amount of health he has remaining, he can sound normal or completely scared out of his wits. This subtle attention to detail regarding the character’s mental state was highly uncommon in 2001. Games that took place from a first-person perspective such as Half-Life or Doom featured no shortage of nightmarish imagery, yet were marginally undermined by the protagonists’ lack of a reaction to them. While this is an understandable limitation brought on by being unable to see your character’s face, the oddity was present in games played from a third-person perspective as well. No matter what dangers they faced, video game protagonists were completely fearless. By establishing Luigi as a coward in Luigi’s Mansion, it adds a lot more weight to the simple act of controlling him. It’s as though you’re acting as his courage, pushing him to brave the perils of the haunted manor despite his overwhelming hesitance. Although there are many great things that can be said of Luigi’s Mansion, it does have a number of flaws. To begin with, the Poison Mushrooms you must dodge while vacuuming the ghosts come across as more annoying than challenging. The Portrait Ghosts have an irritating habit of dropping them when they’re low on health. I can appreciate wanting to add challenge to the game; if they didn’t exist, you could get a gold frame with little trouble. Unfortunately, the Poison Mushrooms were an inorganic method of accomplishing this task, not complementing the general tone of the game. It’s as though the team pulled an asset from an entirely different game and transplanted it into this one. 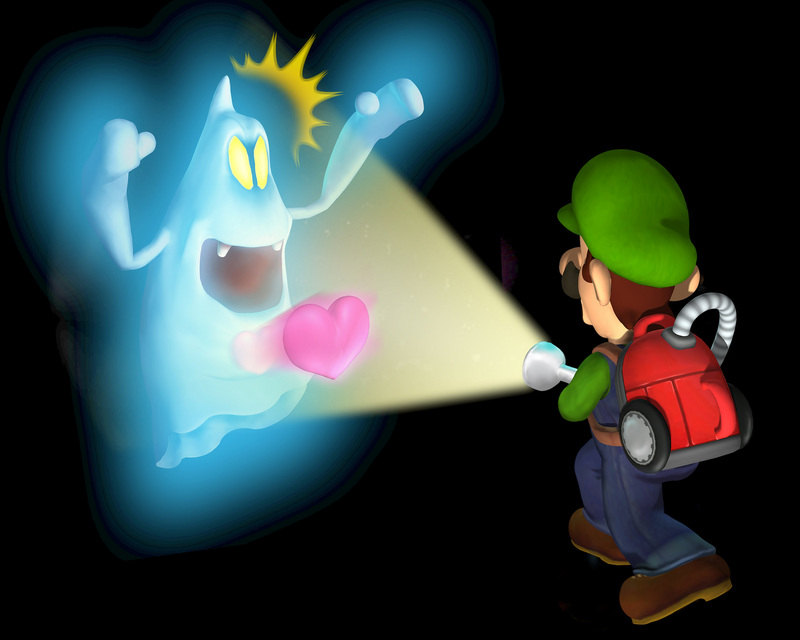 One of the weaker aspects of Luigi’s Mansion concerns the presence of Boos. It’s highly fitting that the classic Mario universe ghost enemies make a return in this lighthearted survival horror title. As Luigi explores the second area, he unleashes a horde of Boos, who proceed to hide in nearly every major room of the mansion. They’re slightly easier to catch than the Portrait Ghosts, as they are always weak to the Poltergust, but you would do well to deplete their health in one shot. If you can’t, they will retreat from the room, forcing you to give chase. This can be tedious for a number of reasons. Shortly after entering the mansion, you may notice that the second floor is divided into two distinct sectors. One is accessible immediately while the other can only be reached after defeating the second boss. Even when both are open for exploration, it is irritating should a Boo phase through the wall dividing the sectors, for it will require a significant amount of backtracking. Moreover, they can potentially disappear into rooms you haven’t yet unlocked, requiring the player to remember to return for it later. They do not heal the damage they’ve taken, but capturing them often sends the player on a wild goose chase that causes serious pacing issues. I can understand why the Boos exist; in a way, they’re analogous to collecting Power Stars in Super Mario 64. Including King Boo himself, there are a total of fifty-one Boos to be found in the game. There is a substantial reward for finding them all, but you need to find only forty to reach the final boss. This is slightly mitigated by the fact that fifteen of them form the third boss, meaning you don’t have to track too many of them down independently to complete the game. Regardless, it’s still ultimately a good idea marred by bad execution. What made the hunt for Power Stars work is that you had to accomplish different tasks to receive them all. With the Boos, you’re typically going through the same motions every time, which makes the process highly monotonous. This ultimately ties into what was by far the most common complaint critics had of Luigi’s Mansion back in 2001: its short length. I personally feel that a game should only be as long as it needs to be, and if a team can deliver a quality experience in the span of four hours, they need not have any reservations doing so. That being said, the short length of Luigi’s Mansion has the potential to be a deal-breaker. Though the mansion boasts an intricate design, there is no getting around how each individual area, of which there are four, can be fully explored from top to bottom in roughly one hour. At the end of the day, I think of the game’s short duration less as its fatal flaw and more the means by which its actual weaknesses are allowed to fester. The reception of Luigi’s Mansion makes for an interesting conversation piece. On the day of the GameCube’s launch, fans were disappointed that there was no follow-up to Super Mario 64 to be found. This was understandable; up until the sixth console generation, a Mario installment had always been among the launch titles of Nintendo’s newest console. With the GameCube, Mario’s official debut in the sixth console generation ended up being a spinoff. It’s the type of game enthusiasts wouldn’t expect to see until long after a standard Mario title had already been released. Coupled with its short length, it was easy to dismiss Luigi’s Mansion as an elaborate tech demo for the GameCube than a fully-fledged work in its own right. Consequently, it was overshadowed by future GameCube titles. Despite this, Luigi’s Mansion would garner enough of a cult following to the extent that by the mid-2010s, it was considered one of the stronger Mario spinoffs. My personal feelings about Luigi’s Mansion are a bit complicated. This is because I think it’s better than critics made it out to be in 2001, yet I also wouldn’t go as far as calling it an essential experience. I will say that its lighthearted take on the survival horror genre combined with Luigi’s ability to vacuum ghosts made it the single greatest interpretation of Ghostbusters in video game form in 2001. Therefore, I can, at the very least, easily recommend Luigi’s Mansion to fans of either Mario or Ghostbusters. Even if you aren’t a fan of either property, picking up this game wouldn’t be a bad idea at all. If nothing else, it doesn’t require a significant investment of your time, so even if you end up disliking it, there is no harm in giving it a shot. I had a blast playing Luigi’s Mansion on my GameCube. I remember a ghost popping up and my friend which happens to be a girl and a gamer who played this game got scared. I almost saved Mario in this game but the huge monster looking thing was always a kill-joy. Anyway, this game was entertaining and thanks for sharing your point. Luigi’s Mansion was the first GameCube game I played and completed. As far as debuts go, it was adequate, showing off the machines capabilities while providing an overall decent experience. I heard the sequel is supposed to be better, though. I have it and its sequel sitting on my shelf. I should probably play them at some point. That wouldn’t be a bad idea at all. Granted, I’ve only played the original, but it does provide a solid experience. Word on the street is that Dark Moon is better. Thanks! And that’s what I’ve heard as well. I haven’t gotten around to playing it, but I will talk about that one when I do. It’ll be interesting to see how the third one is received. Nice review. I definitely enjoyed this one more than you, it seems. Admittedly, when I play it again to review it, I won’t be surprised if age has affected it a bit. But it was a great showcase of the GameCube’s abilities, had original gameplay, and, as you said, helped define Luigi’s character (along with Super Star Saga two years later). I always find it odd when Nintendo’s detractors try to claim that Mario characters have no personality. They certainly aren’t deep, complex characters, but they certainly have personality. The sequel may be a better game in a lot of ways, but it lacks that unique feeling of atmosphere the original had. Luigi’s Mansion on GameCube was like a light Metroidvania, and although it was still cartoony, it still managed to pull off an appropriately dark and spooky atmosphere. Not to the same degree as DKC2 of course, but it’s probably the only other game I can think of that boasted that mix of colorful, cartoonie characters and a legitimately eerie atmosphere (speaking of which, one recurring feature I plan on introducing is discussions of great places in games, and I have one in store involving Crocodile Isle from DKC2 to explain how I think, through environment alone, it builds both tremendous atmosphere and develops its villain). The second Luigi’s Mansion was more polished in some aspects, but it lacked that element. That’s why I kind of hope the third entry learns what the second one did right, and implements them in a game more like the original. Thanks! I enjoyed it just fine back when it released; I just don’t think it’s held up so well. It hasn’t aged super poorly either, though, so revisiting it wouldn’t be a bad idea at all. It really showed how much of an improvement the GameCube was from the Nintendo 64 in terms of graphical capabilities. And yeah, I’m not sure why detractors say that either; did they even play these games? Characters can have personalities even if they don’t have dialogue; I once said that the protagonist of Undertale has more of a character than the average AAA protagonist at the time despite being silent the entire time, and I was only half-joking. Yeah, I really did like that aspect of Luigi’s Mansion; it’s what would happen if you made a Metroidvania/survivor horror in the Mario universe. It doesn’t quite possess to the same degree the “Everything’s out to get you” feel of Donkey Kong Country 2, but it is very atmospheric and all those small touches really go a long way in crafting a unique experience. It’s a major step up from Mario is Missing, though that admittedly isn’t much of a qualifier. I’d say check it out if you’re curious. With the release of the remake, I felt like replaying the Gamecube original a couple of months ago, and I did. All I can say is that I agree with many of your points. It’s a charming title that gains a lot from the uniqueness of its setup and gameplay, and also from Luigi’s fleshed out personaliy. However, it is also repetitive, short, and catching Boos is terribly annoying. It’s a fun game, but the sequel – despite being a step back in the design of ghosts – is far better, and I am looking forward to the third installment. Great review. Yeah, there is something to be said to attempting to deliver a compact experience, but that’s under the stipulation that your work has no filler to speak of, and catching the Boos is filler if I ever saw it. Again, I kind of get their point, but it’s just drawing out a game that wasn’t particularly long to begin with. I’m going to have to check out the sequel at some point before the third game is released; I get the feeling I would like it. The GameCube had absolutely the best controller, but only on games that are specifically designed for it. I think Luigi’s Mansion is an excellent example of that. It wouldn’t have felt nearly as tightly controlled with different triggers or button placement, and it did really demonstrate just what the new controller was capable of. And yeah, I think my favorite part of the game was lending more of a characterization to Luigi. I think he was at the point where he desperately needed it, otherwise was just going to fall further and further into the background. This was really his big step out of the way characters worked in the 80s, and really made him what he is today. I know what you mean; when Metal Gear Solid was ported to the GameCube, I could tell it wasn’t designed with that controller in mind – especially given that using the codec and assault rifle properly involved pushing two buttons. When a Nintendo-developed game was released, it really showed how capable the controller was to those who programmed specifically for it. In the games, Luigi was basically “like Mario, but not”. Even when they gave him slightly different abilities, he didn’t have much of a character distinct from Mario, so I give Luigi’s Mansion a lot of credit for giving him one that really stuck. And you’re right; video game characters from the eighties were designed much differently in how they only really existed as a means for the player to interact with the game world. It wasn’t really until the nineties when developers began consistently writing them as actual characters, and I think the success of Square’s RPGs really helped that along. Great article. The part about ArtX was fascinating. I remember the magazines talking about ArtX before the GameCube launch, but didn’t know what it was. Thank you! It’s very interesting researching the development of these games. Suddenly, these nameless companies you’d only see on labels have a lot more weight to them when you’re aware of their roles.